127 Hours was the one best picture nominee I was most skeptical to see. I was skeptical for several reasons. 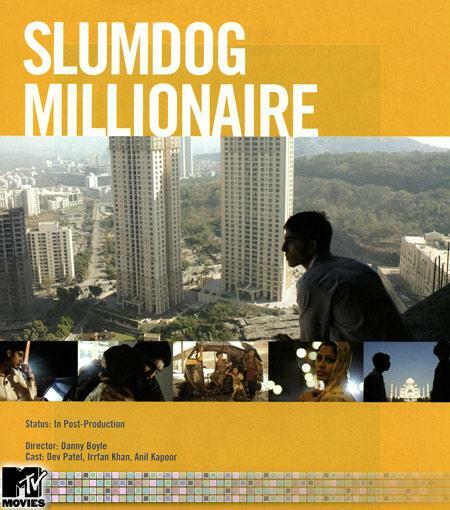 Director Danny Boyle’s previous movie Slumdog Millionaire was hardly my favorite film of 2008. (That honor goes to Goodbye Solo.) Uber-renaissance man James Franco is hardly my favorite actor; I just don’t see the appeal. And, truthfully, I did not see how the story of Aron Ralston amputating his arm after spending five days trapped by a boulder could be translated into film. My cynicism when it comes to film is sometimes my worst own worst enemy. What Danny Boyle has created is the rare film that blends raw emotions, sentimentality, and high stakes action. 127 Hours gets off to a lightening fast start. As Aron Ralston (Franco) prepares for a day of canyoneering in Canyonlands National Park, Utah, he leaves his Swiss Army Knife behind. Aron’s morning is seen in congruence with scenes of places across the world. These are a series of rapid shots made up of three panels of simultaneous action. Aron’s day, this editing technique tells us, is just like any other. Aron meets two hikers (Kate Mara and Amber Tamblyn) and the avid outdoorsman leads them to an underground pool. Their meeting, one girl foreshadows, probably didn’t even figure into Aron’s day. Aron’s real story doesn’t begin until he becomes trapped in a canyon, his arm pinned by a boulder against the canyon wall. The kinetic energy established early on pares down. 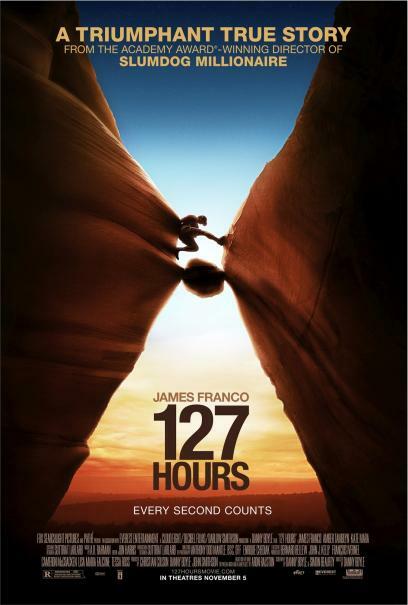 With Aron’s realization that he is alone and his attempts to lift or chisel away at the rock will be wasted, 127 Hours becomes a chronicle of dire survival. Aron retreats into his mind, turning to a video camera to record messages and delusions of his past experiences, family, and relationships to survive. Boyle and cinematographer Anthony Dod Mantle never stray from showing you this amazing stretch of Utah wilderness and how alone Aron Ralston really was. The canyon Aron inhabits is small; in five days it becomes his home and he knows every detail of it. Without his own knowledge of survival tactics, technology and, above all, the power of his mind, there is no way he could have lived. How do you capture what was a grueling and primarily mental event? It is, in part, the pacing and energy of 127 Hours that makes the film what Roger Ebert describes as “an exercise in conquering the unfilmable.” The film begins fast and never falters, not even in the sequences when Aron is completely alone. 127 Hours is as gut-wrenchingly powerful as it is a testament to the vitality of the human spirit. It is fitting then that 127 Hours ends as it begins. With a reminder that Aron Ralston is just another person apart of the world’s daily grind. I’m going to be so happy after the Academy Awards because then I can finally stop posting about Slumdog Millionaire winning every award possible. It is kind of getting redundant and boring. In addition to winning the WGA for Best Adapted Screenplay this weekend, Slumdog swept the BAFTAs, receiving 7 awards. Here is the complete list of BAFTA winners. 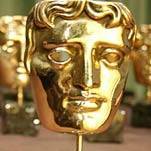 The complete list of BAFTA Winners can be found here. What Are The Reasons Behind Slumdog’s Success? 5. The Tourist Factor: For those whose only exposure to India might have been phone calls to customer service and the odd curry dinner, “Slumdog” is an eye-opener. Boyle resisted stepping back and shooting the movie like a travelogue. Instead, he thrusts the audience into a street-level view of the sights and sounds of India — from the slum’s crowded back alleys to the new gleaming towers of Mumbai, from the Taj Mahal to a stomach-churning outhouse. When you watch “Slumdog,” you feel like you’ve been to India. 6. Bollywood: Remember back during the early ’90s when Tinseltown did a collective double-take about wildly over-the-top flicks coming out of Hong Kong, movies like “The Killer,” “City on Fire” and “Supercop”? It wasn’t long afterwards that the likes of John Woo and Chow Yun Fat were making movies stateside and Hong Kong choreographers like Yuen Woo-ping were in high demand to add some kung fu spice to films like “The Matrix.” Well, the same might be happening now with Bollywood. I just don’t get the hype surrounding Slumdog Millionaire. It’s is a good story with a nice happy ending but as far as it being the best movie of the year… I just don’t see it. Maybe I have to see it again and then I’ll jump on the Slumdog bandwaggon. But for me, at this moment, there is something not quite appealing about Slumdog Millionaire. I am glad that this article mentioned “The Tourist Factor” because I think that plays a huge part in Slumdog’s appeal. It is just another example of how the West becomes completely enthralled by the East. Here is my review of Slumdog Millionaire. Author JoannaPosted on January 14, 2009 July 21, 2011 Categories Academy Awards, BollywoodTags Danny Boyle, Slumdog MillionaireLeave a comment on What Are The Reasons Behind Slumdog’s Success?